I bought this cool glitter polish when I was visiting Rhodos town in Greece a few weeks ago. I'd never seen anything like this. Sure, the glitter itself isn't so unique, but I've never seen silver flakes that look like cracked glass in a nail polish before. 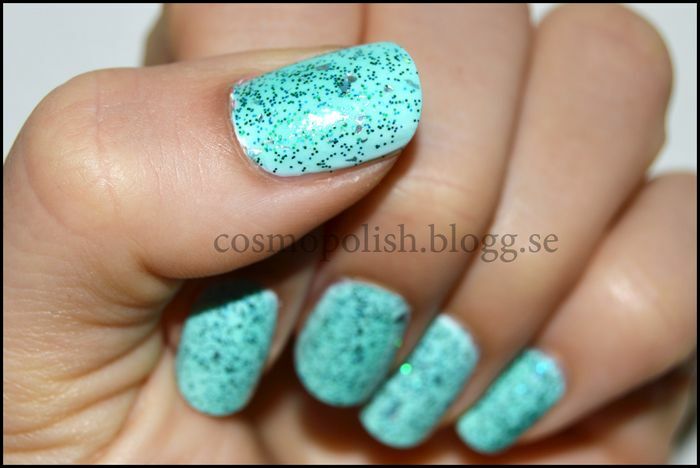 The polish contains tiny blue and green hexagon glitter, the mixture of colors brings out a turquoise hue. As I said, the polish also contains something else, I think it looks like broken glass which of course it is not. You can see them clearly in the picture above. I love this polish, it makes me think of the ocean and mermaids. I wore it over a white polish and then it covered with two coats.